Surrendering when nothing is clear | Blooming Joy! This is what my drive into work looked like today. 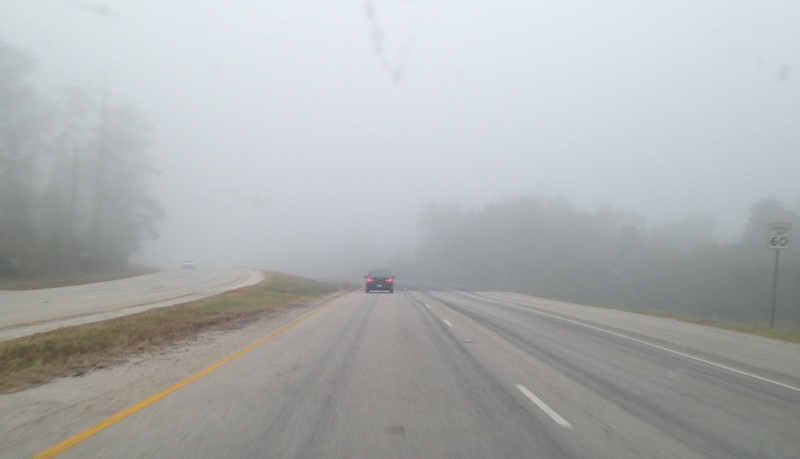 Please ignore the spots from the windshield – the point is how thick the fog is. I couldn’t see very far in front of my car, and I would not have been able to tell if there was a hazard in the road up ahead. That’s kind of how my life feels right now. I only know tiny pieces of the road ahead, and I can’t see very far into the future. I am worried that there could be some hazards hidden in the mist, but I won’t see them until it’s too late. So I’ve slowed down. I stay cautious. I keep my eyes open for signs of what may come, knowing that at any point something could dart into my path. I’ve had a recurring nightmare off and on for most of my life: driving into a fog over a bridge, only to have the bridge end halfway and I plummet off the edge. I probably only remember it because I startle myself awake. I think I’ve finally figured out what it means, even though I haven’t had the dream in a long time. I’m scared of something horrible hiding in the unknown future. It’s why I’m such a control freak. I need to take care of every detail, and plan for what’s ahead. If something is going to change, I want to know ahead of time so I can prepare. But life doesn’t work like that. There aren’t signs posted to warn us that there’s a sharp turn coming. Most of the time, the turns come without warning, and if we’re traveling at breakneck speeds we’re bound to get hurt. Losing our children taught me that slowing down is ok. When the bottom drops out, you can press pause on a whole lot of unimportant things. That’s how I am getting through each day right now. I’ve let a lot of stuff go. It’s not important right now. Slowing down and paying attention is the only thing I can do. But even there, I’m still trying to maintain control, and I’m starting to realize that I can’t do that. God is calling me to surrender all of it – everything that gives me a sense of security – and find my peace ONLY in Him. He is peace. So I’m trying to let go. It’s really hard. I find that trusting God COMPLETELY is the hardest thing I am called to do. Yet He is faithful, even when I am not. Amen! Thank you for sharing your thoughts and life with us.